As the staff is creating the Orange and Blue teams for the Session, campers are placed on World Games teams as evaluations take place. In addition to playing games on the fields and courts, teams are challenged to come up with a cheer that is presented in front of the entire Boys or Girls camp. If you can’t view these videos, please visit our YouTube page. The first week of First Session has featured Team Cheers competition, World Games, the beginning of Orange and Blue games and most of all: lots and lots of fun in both Camps! View these photos on an iPad or mobile device HERE. And please be aware that you can send your child unlimited emails that will be printed and placed in their mail box each morning via Bunk Notes. For our new users, the pre-approval code is SUS2012. 25 Jun First Session Opening Day! If the first day of our First Session is any indication, 2012 will be one of the best years we’ve ever had! 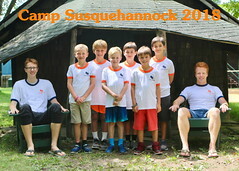 We were fortunate to have incredible weather that provided a fitting backdrop as our staff welcomed your child to Camp. 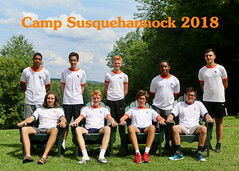 Here’s a sampling Opening Day’s events, including cabin preparation, enthusiastic reunions, pick-up games, an evening meeting with the entire Camp and S4B Dodgeball. Check back as we will add more photos to this Opening Day slideshow! I do not have to look at a calendar to know we are in the final days until we leave for Camp. No, there are other indications about what time of year it is. Looking in all the desk drawers for black laundry marking pens; the hundreds of iron-on “Hano” labels lying around; packs of new socks and underwear, boxes of new shoes; and piles of clothes and sports equipment signal the approach of camp like the turning of leaves in October brings the fall season. As we prepare to leave for camp and I contemplate renting a Uhaul to transport all this stuff there, my wife and I ask the question, “What do we really need to bring?” I began to think about some of the best and worst things I brought to camp in the past. There must be some item that bore the four letters of my last name that inspired envy among the other campers. Of course, there had to be something so useless I could not believe my stupidity for using valuable space bringing it with me. Topping the “Best of” list has to be a lamp. I remember it vividly: a black toy train with an arm that unfolded upwards holding the lightbulb. I brought it for the first time as a CIT in the Lodge. That lamp transformed reading at night after the cabin lights went out. No longer was it necessary to clamp my flashlight between shoulder and head at the perfect angle to see the pages of my book, only to readjust every time I turned a page. I would compare it to talking hands free on a cell phone! The train lamp found its way to camp (and later college) for the next eight summers. The “Useless” list is a little more difficult. For example, the weather for a summer can render something completely unusable, like a fleece last summer when the temperatures never seemed to drop below 85. But I do remember the rubber rainboots that made their way with me my first summer. I did use them…on a hiking trip through a gorge. As if slipping across wet rocks all day was not enough, I reduced the raging stream to a trickle carting most of the stream water back to camp inside those impermeable rubber rainboots. Ever since, an old pair of sneakers have proved far more practicable than those rubber rain boots. 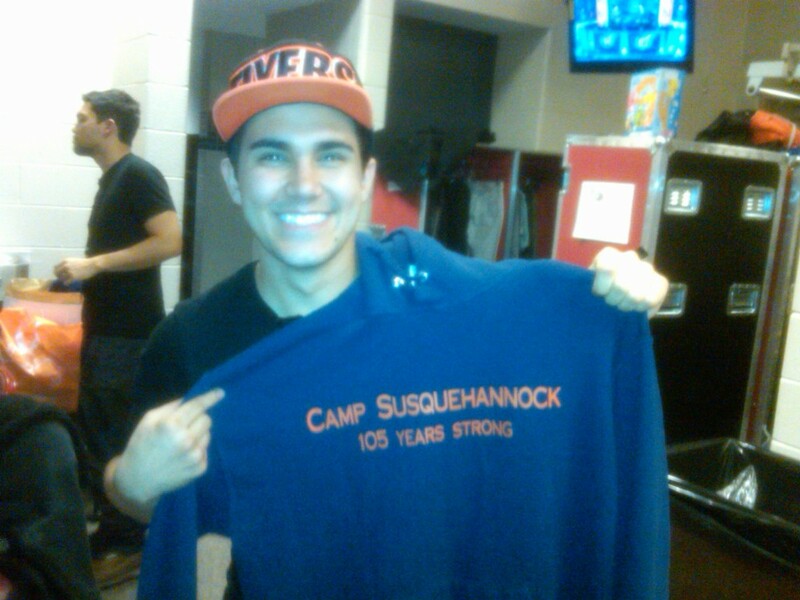 During a Big Time Rush performance in Philadelphia, PA, S4B alum Carlos Pena took a moment out of his busy schedule to show off his Camp hoodie that travels with him on tour. Carlos also generously autographed a photo of Tripp Lake, which is the Grand Prize in our “Never Leave Home Without It” contest! Send in a photo of you with your favorite piece of Camp gear in the most unique place you can think of. All entries will appear in the Spring 2012 issue of the “Who’s Who in Orange and Blue” newsletter that will be published in April. The winner will be selected by a panel of non-celebrity judges and awarded the signed photo. 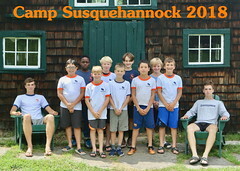 To enter your photo in the contest, please email it by March 1, 2012 to orangeandblue@susquehannock.com. Also, don’t forget to tell us what you’ve been up to since Camp ended – you can fill out the online form HERE. Campers, staff and family alike gathered on Sunday, January 9, 2012 to usher in the new year with our annual Winter Reunion. The day began with lunch at Minella’s Diner and then proceeded roughly 1.8 down Lancaster Avenue for an afternoon of bowling at Devon Lanes. 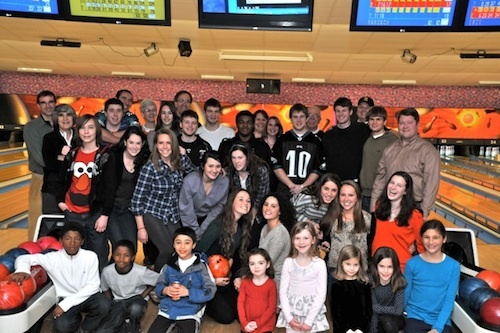 Refreshments at the bowling portion of the Reunion were generously donated by Ted Volikas, father of S4B camper Theo and owner of Pinocchio’s Pizzeria in nearby Media, PA. It was a great afternoon of fun and a wonderful chance to catch up with many friends not seen since the summer. 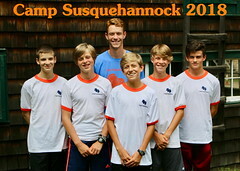 Everyone is already looking forward to the summer of 2012 at Camp Susquehannock! 08 Dec Never Leave Home Without It! Big Time Rush’s Carlos Pena brings his Susquehannock hoodie on tour with him – where have you and your Camp gear traveled? 28 Nov Susquehannock Winter Reunion Details Announced! We are very happy to once again invite you and your child to our annual Winter Reunion on Sunday, January 8, 2012. The fun begins at 1:00 pm at Minella’s Diner (320 West Lancaster Avenue, Wayne, PA 19087) where we will meet for lunch and then will continue on down the road to Devon Lanes (300 W. Lancaster Avenue, Devon, PA 19333 ) for bowling at 3:00 pm. We will be providing refreshments during the Bowling portion of the afternoon; lunch at Minella’s will be an out of pocket expense. We need a RSVP numbers for both Minella’s and Devon Lanes, so please email josho@susquehannock if you’re interested in coming to either or both. Thanks! 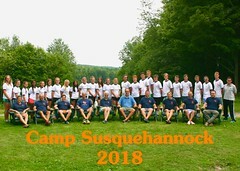 Click HERE for more Reunion information on our Facebook event page and stay up to date with all other Camp events HERE. Also, we are still looking for families to host Camp receptions this winter. These events are the most successful marketing tool we have in our arsenal, so if you are interested in hosting an event to educate prospective families about Susquehannock, please contact Josh. He will work with you to set up the event on a day convenient for your family. We have already had two receptions this off-season that have led to multiple enrollments for the summer of 2012. 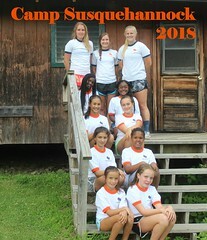 Thank you very much for your continued support of Camp Susquehannock!